This article is about the war memorial on Whitehall, London. For cenotaphs in general, see Cenotaph. For other uses, see Cenotaph (disambiguation). The Cenotaph is a war memorial on Whitehall in London, England. Its origin is in a temporary structure erected for a peace parade following the end of the First World War, and after an outpouring of national sentiment it was replaced in 1920 by a permanent structure and designated the United Kingdom's official national war memorial. Designed by Edwin Lutyens, the permanent structure was built from Portland stone between 1919 and 1920 by Holland, Hannen & Cubitts, replacing Lutyens' earlier wood-and-plaster cenotaph in the same location. An annual Service of Remembrance is held at the site on Remembrance Sunday, the closest Sunday to 11 November (Armistice Day) each year. Lutyens' cenotaph design has been reproduced elsewhere in the UK and in other countries of historical British allegiance including Australia, Canada, New Zealand, Bermuda and Hong Kong. The First World War (1914–1918) produced casualties on a previously unseen scale. Over 1.1 million men from the British Empire were killed. In its aftermath, thousands of war memorials were built across Britain, the Empire, and the former battlefields. Amongst the most prominent designers of war memorials was Sir Edwin Lutyens, described by Historic England as "the foremost architect of his day". Lutyens established his reputation designing country houses for wealthy clients around the turn of the 20th century and became a public figure as the designer of much of New Delhi, the new capital of British India. The war had a profound effect on Lutyens and following it he devoted much of his time to the commemoration of casualties. By the time he was commissioned for the cenotaph, he was already acting as an adviser to the Imperial War Graves Commission. Lutyens' first war memorial was the Rand Regiments Memorial in Johannesburg, South Africa, dedicated to casualties of the Second Boer War (1899–1902). His first commission for a memorial to the First World War came from Southampton. The word "cenotaph" derives from the Greek term "kenotaphion". Lutyens first encountered the word in connection with Munstead Wood, the house he designed for Gertrude Jekyll in the 1890s. There he designed a garden seat in the form of a rectangular block of elm set on stone, which Charles Liddell—a friend of Lutyens and Jekyll and a librarian at the British Museum—christened the "Cenotaph of Sigismunda". Lutyens remembered the term when working on Southampton's memorial in early 1919, where he proposed a cenotaph after his first design was rejected on cost grounds. The end result (unveiled a week before the permanent version of the Whitehall cenotaph) lacks the subtlety of Whitehall's monument, but introduces several design elements common in Lutyens' subsequent memorials, including Whitehall. Paris Victory Parade of 14 July 1919 and the temporary catafalque (right) by the Arc de Triomphe (left). The war formally ended with the signing of the Treaty of Versailles on 28 June 1919 (though fighting ceased with the Armistice of 11 November 1918), and the British government planned to hold a victory parade (also referred to as a peace celebration) in London on 19 July, which would involve soldiers marching down Whitehall. The initial design for what would become the cenotaph was one of a number of temporary structures erected for this parade. A similar parade due to be held in Paris - the British prime minister, David Lloyd George, learnt that the French parade was to include a saluting point for the marching troops and was keen to replicate the idea for the British parade. How Lutyens became involved is unclear, but he was close friends with Sir Alfred Mond and Sir Lionel Earle (respectively the government minister and senior civil servant at the Office of Works, which was responsible for public building projects) and it seems likely that one or both men discussed the idea with Lutyens. Lloyd George summoned Lutyens[a] and asked him to design a "catafalque", which would serve a similar purpose at the British parade. Lloyd George emphasised that the structure was to be non-denominational. Lutyens met with Sir Frank Baines, chief architect at the Office of Works the same day to sketch his idea for the Cenotaph and sketched it again for his friend Lady Sackville over dinner that night. Both sketches show the Cenotaph almost as-built. Although Lutyens apparently produced the design very quickly, he had had the concept in mind for some time, as evidenced by his design for Southampton Cenotaph and his work for the IWGC. According to Tim Skelton, author of Lutyens and the Great War, "If it was not to be on Whitehall then the Cenotaph as we know it would have appeared somewhere else in due course". Several of Lutyens' sketches survive, which show that he experimented with several minor changes to the design, including a flaming urn at the top of the Cenotaph and scultures of soldiers or lions at the base (similar to the lion heads on Southampton Cenotaph). The unveiling (described in The Times as a "quiet" and "unofficial" ceremony) took place on 18 July 1919, the day before the Victory Parade. Lutyens was not invited. 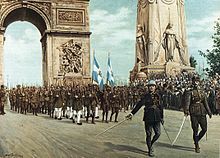 During the parade, 15,000 soldiers and 1,500 officers marched past and saluted the Cenotaph—among them were General John J. Pershing (United States) and Marshal Ferdinand Foch (France), as well as the British officers Field Marshal Sir Douglas Haig and Admiral of the Fleet Sir David Beatty. The Cenotaph quickly captured the public imagination. Repatriation of the dead had been forbidden since the early days of the war, so the cenotaph came to represent the absent dead and served as a substitute for a tomb. Beginning almost immediately after the Victory Parade and continuing for days afterwards, members of the public began laying flowers and wreaths around the Cenotaph's base. Within a week, an estimated 1.2 million people came to the cenotaph to pay their respects to the dead, and huge quantities of flowers were laid at the base of the monument. According to The Times, "no feature of the victory march in London made a deeper impression than the Cenotaph". Four days after the parade, William Ormsby-Gore, Member of Parliament for Stafford and an army officer who fought in the war and was part of the British delegation at Versailles, questioned Mond about the Cenotaph in the House of Commons, and asked whether a permanent replacement was planned. Ormsby-Gore was supported by multiple other members; Mond announced that the decision rested with the cabinet, but promised to pass on the house's support. The following week, The Times published an editorial calling for a permanent replacement (though it felt that there was a risk of vehicles crashing into the Cenotaph in its original location and suggested it be built on nearby Horse Guards Parade); multiple letters to London and national newspapers followed. The cabinet sought Lutyens' opinion, which was that the original site had "been qualified by the salutes of Foch and the allied armies" and "no other site would give this pertinence". The cabinet bowed to public pressure, approving the re-building in stone at its meeting on 30 July. Mond gave Lutyens the opportunity to make any amendments to the design before work began on the permanent Cenotaph; the architect submitted his proposed modifcations on 1 November. He replaced the real laurel wreaths with stone sculptures and added entasis—subtle curvature, reminiscent of the Parthenon in Greece, so that the vertical surfaces taper inwards and the horizontals form arcs of a circle. Lutyens had previously used entasis for his Stone of Remembrance, used in many IWGC cemeteries. This was accepted without issue. The only other significant alteration Lutyens proposed was the replacement of the silk flags on the temporary Cenotaph with painted stone, fearing that the fabric would quickly become worn and look untidy. He was supported on this by Mond and engaged the sculptor Francis Derwent Wood for assistance, but the change was rejected by the cabinet. A diary entry by Lady Sackville, a long-time friend of Lutyens', from August 1920 records the architect complaining bitterly about the change, though documents in the National Archives suggest that he had been aware of it six months prior. Concerns remained about the Cenotaph's location. Another editorial in The Times suggested siting it in Parliament Square, away from traffic, a location that that was supported by the local authorities. The issue was again raised in the House of Commons; Ormsby-Gore led the calls for the Cenotaph to be rebuilt on its original spot, stating, to acclaim, that he was certain that this option was the most popular with the public. Opposition to the site eventually quietened and the construction contract was awarded to Holland, Hannen & Cubitts. Construction began in May 1920. The Cenotaph, made entirely from Portland stone, is a pylon on a rectangular plan, with gradually diminishing tiers, culminating in a sculpted tomb chest (the empty tomb) on which is placed a laurel wreath. Its mass decreases with its height. The base of the cenotaph is in four stages from the top of the steps starting with the plinth, which connects to the base block. The plinth projects 3 inches (7.6 centimetres) from the base block on all four sides. Above it is the transition moulding which is in three stages-torus (semi-circular), cyma reversa, and cavetto, taking the lower part of the structure just over 6 feet (1.8 metres) above the ground. Architerual historian Allan Greenberg describes this section as "quietly establish[ing] the memorial's overall character: an outward appearance of simple repose which, on close observation, shows itself to be dependent on the more complex forms of its masses". The structure is moulded onto a base of three diminishing steps on an island in the centre of Whitehall surrounded by government buildings. The cenotaph is austere, containing very little decoration. At each ends, on the second tier below the tomb, is a laurel wreath, the work of sculptor Francis Derwent Wood, and on the sides is the inscription THE GLORIOUS DEAD. The only other inscription is the dates of the world wars in Roman numerals—the first on the ends, above the wreath, and the second on the sides. The sides of the cenotaph are not parallel but are subtly curved so as to be barely visible to the naked eye (entasis). If extended, the apparently vertical surfaces would meet 1,000 feet (300 m) above the ground and the apparently horizontal surfaces are sections of a sphere whose centre would be 900 feet (270 m) below ground. This element of the design was not present in the temporary structure but was added by Lutyens as a refinement when designing the permanent structure. It is 35 feet (11 m) tall and weighs 120 tonnes (120,000 kg). The architects waived their fee for designing the cenotaph, meaning that it cost £7,325 (equivalent to £289,000 in 2018) to build. Construction began on 19 January 1920, and the original flags were sent to the Imperial War Museum. The White Ensign, Union Flag, and Blue Ensign on the Cenotaph. The Cenotaph is flanked on each side by flags of the United Kingdom which Lutyens had wanted to be carved in stone. Although he was overruled and cloth flags were used, Lutyens went on to use stone flags on several of his other war memorials, painted on Rochdale Cenotaph and Northampton War Memorial (among others), and unpainted at Étaples and Villers-Bretonneux IWGC cemeteries. In the years following 1919, the Cenotaph displayed a Union Flag, a White Ensign and a Red Ensign on one side and a Union Flag, a White Ensign, and a Blue Ensign on the other side. On 1 April 1943, an RAF Ensign was substituted for the White Ensign on the west side. The flags displayed as of 2007 represent the Royal Navy, the British Army, the Royal Air Force and the Merchant Navy. The Blue Ensign represents the Royal Naval Reserve, the Royal Fleet Auxiliary, and other government services; it is possible that it was also intended to represent Dominion forces. Initially the flags were changed for cleaning every six to eight weeks, but between 1922 and 1923 the practice gradually stopped until letters to the media led to its reintroduction. The initial lifespan of a flag was set at five periods of three months. By 1939, they were changed ten times a year, each flag washed twice before being disposed of. By 1924, it was decided that all discarded flags would be sent to the Imperial War Museum who could redistribute them to properly accredited organisations. The unveiling ceremony on 11 November 1920. No date was announced for the completion of the Cenotaph at first, but the government were keen to have it completed in time for Remembrance Day on the second anniversary of the armistice. In September 1920, the announcement came that the Cenotaph would indeed be unveiled on 11 November, and that the act would be performed by the king. At a late stage in the planning, the government decided to hold a funeral for an unidentified soldier exhumed from a grave in France, known as the Unknown Warrior, and inter him in Westminster Abbey, and the decision was taken to make the unveiling part of the funeral procession. George V unveiled the Cenotaph at 11am on 11 November, this time with Lutyens in attendance, before proceeding to the abbey. The unveiling ceremony was part of a larger procession bringing the Unknown Warrior to be laid to rest in his tomb nearby in Westminster Abbey. The funeral procession route passed the Cenotaph, where the waiting King laid a wreath on the Unknown Warrior's gun-carriage before proceeding to unveil the memorial which was draped in large Union Flags. The public response to the newly unveiled memorial exceeded even that to the temporary Cenotaph in the aftermath of the armistice. Whitehall was closed to traffic for several days after the ceremony and members of the public began to file past the Cenotaph and lay flowers at its base. Within a week, it was 10 feet (3 metres) deep in flowers and an estimated 1.25 million people had visited it. In the later 1920s, several proposals emerged for modifications to the Cenotaph, including the addition of life-size bronze statues at its corners, and installing a light inside the wreath at the top to emit a vertical beam, but all were rejected by the Office of Works on Lutyens' advice. Whitehall, along with other areas of London, was the scene of celebrations on 8 May 1945 when victory in Europe was declared in the Second World War. More formal processions past the Cenotaph took place during the London Victory Celebrations on 8 June 1946. The Cenotaph had been designed to commemorate the British Empire military dead of the First World War, but this was later extended to include those that died in the Second World War. The dates of the Second World War were added in Roman numerals on the sides of the memorial (1939—MCMXXXIX; and 1945—MCMXLV), and the memorial was unveiled for a second time on Sunday 10 November 1946 by King George VI. The memorial is now also used to remember the dead of later wars in which British servicemen and servicewomen have fought. The Cenotaph was designated a Grade I listed building on 5 February 1970. In 1921, Lutyens was awarded the Royal Institute of British Architects' highest award, the Royal Gold Medal for his body of work. Presenting the medal, the institute's president, John Simpson, described the Cenotaph as "the most remarkable of all [Lutyens'] creations". Wreaths being laid at the Cenotaph during the Remembrance Sunday service in 2010. Although the Armistice Day ceremony fell away during the Second World War, in recent years the tradition of holding a ceremony at the Cenotaph at 11am on 11 November has been reinstated by The Western Front Association, a UK-based charity dedicated to perpetuating the memory of those who served in the First World War. The first such modern ceremony was held on 11 November 1919, following a suggestion by King George V for a two-minute silence across the United Kingdom and a ceremony to take place in London. Thousands had gathered around the wood-and-plaster Cenotaph in Whitehall, where Prime Minister David Lloyd George walked from Downing Street to place a wreath. A wreath was also laid by a representative of the French President, and soldiers and sailors provided a guard of honour. There were also processions past the Cenotaph organised by veterans' associations. The Cenotaph featured on the reverse of the 1928 Armistice Day memorial medal by Charles Doman. Annual remembrance services also take place at the Cenotaph on other days of the year. These include the regimental parade held by the Royal Tank Regiment on the Sunday following Remembrance Sunday. This is the closest to Cambrai Day (20 November), the anniversary of the Battle of Cambrai that was one of the earliest massed deployments of British tanks. On Anzac Day, 25 April, a Wreath Laying Ceremony and Parade is held at the Cenotaph at 11 am, followed by a Service of Commemoration and Thanksgiving at Westminster Abbey. An annual parade and service is also held by the Combined Irish Regiments Association to commemorate the war dead of the Irish regiments that were disbanded on 12 June 1922 after the First World War. This parade is now held on the Sunday in June that follows the Queen's Birthday Parade. The Belgian Parade at the Cenotaph has taken place yearly since 1934 on the Sunday preceding the Belgian National Day (21 July). Belgium is the only nation that is allowed to parade its troops in uniform and carrying arms in central London. The War Widows Association of Great Britain hold their Annual Service of Remembrance at the Cenotaph on the day before Remembrance Sunday. 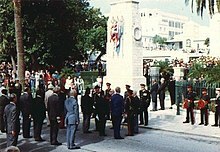 Remembrance Day parade, at the Cenotaph in the City of Hamilton, Bermuda, 1990. Lutyens' first cenotaph design was for The Cenotaph, Southampton (unveiled 6 November 1920). The temporary Whitehall Cenotaph (unofficial unveiling on 18 July 1919) was followed by the permanent Whitehall Cenotaph (unveiled 11 November 1920). Lutyens' Whitehall Cenotaph design was used in the construction of other war memorials in the UK and in the British Empire. Two smaller versions that included several additions and differences were built as regimental memorials, the Queen's Own Royal West Kent Regiment Cenotaph in Maidstone, Kent, and the Royal Berkshire Regiment War Memorial in Reading, Berkshire. These were unveiled on 30 July 1921 and 13 September 1921 respectively. The Midland Railway War Memorial, Derby, was unveiled on 15 December 1921. The Middlesbrough cenotaph, derived from Lutyens' design, was unveiled on 11 November 1922. The Rochdale Cenotaph was unveiled on 26 November 1922. The Hong Kong cenotaph, an almost exact replica, was unveiled in 1923 between the Statue Square and the City Hall in Hong Kong. The Manchester Cenotaph in Manchester, England (also the work of Lutyens), was unveiled on 12 July 1924 and has similarities and differences. The Welch Regimental War Memorial, in the form of a Lutyens 'Whitehall' cenotaph, was unveiled at Maindy Barracks, Cardiff, on 11 November 1924. The Toronto Cenotaph was unveiled on 11 November 1925 and is modelled on Whitehall's design. A two-thirds scale copy was unveiled in Hamilton, Bermuda, on 6 May 1925. A close copy of the Whitehall Cenotaph was unveiled in November 1929 in Auckland, New Zealand. An exact replica stands in London, Ontario, Canada, and was unveiled on 11 November 1934. ^ The exact date of the meeting between Lutyens and Lloyd George was not recorded. Lutyens' biogrpaher Christopher Hussey puts it at 19 July, which cannot be correct as this was the date of the parade, by which time the temporary cenotpah had already been built. Architectural historian Allan Greenberg and Tim Skelton, author of Lutyens and the Great War both speculate that the meeting must have taken place in early July. Greenberg, Allan (March 1989). "Lutyens' Cenotaph". Journal of the Society of Architectural Historians. Oakland, California: University of California Press. 48 (1): 5–23. doi:10.2307/990403. ISSN 2150-5926. JSTOR 990403. Massingham, Betty (1966). Miss Jekyll: Portrait of a Great Gardener. London: Country Life. pp. 140–142. ^ a b c d e Historic England. "The Cenotaph (1357354)". National Heritage List for England. Retrieved 22 January 2019. ^ a b Greenberg p. 7. ^ a b c "BBC – Remembrance – Cenotaph". BBC. Retrieved 3 July 2011. ^ a b Skelton, p. 42. ^ a b Skelton, p. 43. ^ a b Greenberg, p. 8. ^ a b c Skelton, pp. 43–45. ^ a b Greenberg, p. 11. ^ a b c d "Flags on the Cenotaph" (PDF). The Flag Institute. Retrieved 3 July 2011. ^ a b Jones, Nigel R (2005). Architecture of England, Scotland, and Wales. Westport, CT: Greenwood Press. p. 62. ISBN 0313318506. ^ a b Skelton, p. 47. ^ "The Unknown Warrior". BBC History. Retrieved 3 July 2011. ^ Hornby, Martin (2008-07-07). The Burial of the Unknown Warrior. Martin Hornby, The Western Front Association, 7 July 2008. Retrieved 25 July 2011-07-25 from http://www.westernfrontassociation.com/great-war-people/memorials/400-burial-unkown.html. ^ "The Cenotaph in Whitehall". RAF Habbaniya Association. Retrieved 3 July 2011. ^ "All London Silent at Armistice Hour" (PDF). The New York Times. 12 November 1919. ^ "ANZAC DAY - Tuesday 25th April 2017". uk.embassy.gov.au. Australian High Commission, United Kingdom. Retrieved 29 September 2017. ^ "80th Belgian Cenotaph Parade". Retrieved 1 February 2017. ^ Lefort, Rebecca; Craig, Olga (13 November 2010). "War widows remember the husbands who died serving their country". www.telegraph.co.uk. Telegraph Media Group Limited. Retrieved 29 September 2017. ^ Historic England. "The Queen's Own Royal West Kent Regiment Cenotaph (1086395)". National Heritage List for England. Retrieved 6 August 2016. ^ Historic England. "The Royal Berkshire Regiment Cenotaph (1321912)". National Heritage List for England. Retrieved 6 August 2016. ^ Pevsner, Nikolaus (1966). Yorkshire: The North Riding. p. 252. ^ "North Yorkshire War Memorials – Middlesbrough". The Yorkshire Regiment – First World War Remembrance. Retrieved 3 November 2013. ^ "Brief Information on Proposed Grade 1 Items" (PDF). Leisure and Cultural Services Department, Hong Kong. Retrieved 3 July 2011. Wikimedia Commons has media related to Cenotaph, London. Glyn Prysor: Cenotaph, in: 1914-1918-online. International Encyclopedia of the First World War.